Just how driven is Len Forkas? Consider this: a few weeks ago, the 52-year-old entrepreneur raced from Oceanside, California to Annapolis, Maryland on a bicycle–and finished in less than twelve days. Forkas’ amazing accomplishment occurred during the 2012 Race Across America, a grueling, 3,000-mile course that’s almost 30% longer than the Tour de France. On average, he rode 20 hours a day, subsisting on an 80% liquid diet that left him ten pounds lighter by the end to the race. Out of this year’s 46 solo competitors, 28 finished. Forkas was first in his age group and tenth overall. His time: 11 days, four hours and 47 minutes. While endurance athletes often compete in Race Across America for the physical challenge, that wasn’t the primary reason for Forkas, a past participant in five Ironman Triathlons. His goal was to raise awareness and money for Hopecam, his Reston, Virginia-based charity that uses Web cameras, laptops and other forms of technology to connect homebound children undergoing treatment for cancer with their friends at school. That restlessness prompted him to go to business school, where he obtained the knowledge he needed to transition from a technician to a manager. After earning an MBA from American University, he worked at Oxford Development Corporation and at Winchester Homes. Later, he joined NationsBank, where he oversaw the development of a 900-acre mixed-use community in Maryland named Milestone. “I found my calling when I got into the real estate business,” he says. He also knew he wanted to be his own boss one day. “I had seen people in their 50s laid off and didn’t want to be in that position,” says Forkas. In December 1995, when he was in his mid-30s, he received his own layoff notice. While shoveling snow in front of his house, he pondered his situation and decided to write a memo to his boss at NationsBank detailing the large volume of work that needed closure before his departure. Based upon the ten-page memo, the bank asked him to stay. It hired him as a consultant, giving Forkas his start as a commercial real estate entrepreneur. In 2000, at age 40, Forkas founded Milestone Communications, the manager of more than 900 locations for future tower development throughout the Washington, D.C. area. Like most entrepreneurs, he had challenges at the beginning. One lesson was learning to let go of the benefits associated with a corporate job. His professional difficulties, however, paled in comparison to one he faced in his personal life. In 2002, his son Matt, then ten years old, received a diagnosis of leukemia. After witnessing the loneliness and isolation that Matt (who’s now healthy) endured while undergoing treatment, Forkas founded Hopecam to help other children facing similar ordeals. So far, the nonprofit has connected more than 250 homebound children with their classmates, friends and family. As he rode across the country, Forkas applied the power of third-party accountability, a concept from Daniel H. Pink’s bestseller, Drive: The Surprising Truth About What Motivates Us. “I made so many commitments–to the children I was riding for each day, the sponsors who donated thousands of dollars, and the crew who gave two weeks of their vacation to help me–that I could not dream of quitting,” he says. For Forkas, the race taught or reaffirmed the importance of many other principles. Among them: focus on what you can control, don’t second guess your team, validate the work people do and prepare thoroughly. Apparently, Forkas made the right decision by competing in Race Across America. 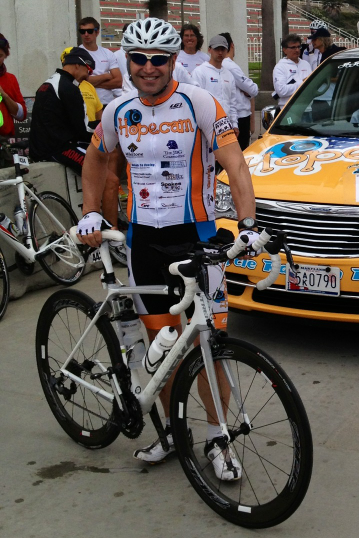 In addition to his impressive finish, he raised $320,000 for Hopecam, far exceeding the organization’s initial goal of $150,000. Would he do it again? “No,” says Forkas emphatically. But he couldn’t be happier about the new relationships he’s formed and the growth opportunities presented by the financial outcome. This entry was posted in Business, Career Changes, Careers, entrepreneurs, Entrepreneurship, Leadership, Success and tagged bicycles, cycling, Interviews, sports, Work. Bookmark the permalink. A memo like that can clarify things for both the writer and the recipient. Thanks for reading. Amazing achievement for a great cause. Very inspirational! Great story and a great cause! The best part is that Hopecam is now positioned to help more young cancer patients. Thanks for commenting. What a ride!!! Both the cycling and the entrepreneurial journey. Indeed! It sure raises the bar for what’s possible, doesn’t it? This is a wonderful article about an inspiring individual. He certainly saw opportunities everywhere around him without recoiling in frustration, feeling the victim or falling off the radar. He is leading his own “self-styled life.” Love this. Congratulations for all he has accomplished not just for himself, but for others, too. Well said, Georgette. Thank you! No doubt about it — tenacity is essential to fulfill long-term goals. Thanks for the reblog.